Per icethics Canucks are getting new Jersey next year. 019 HOME & ROAD JERSEYS: Expected. 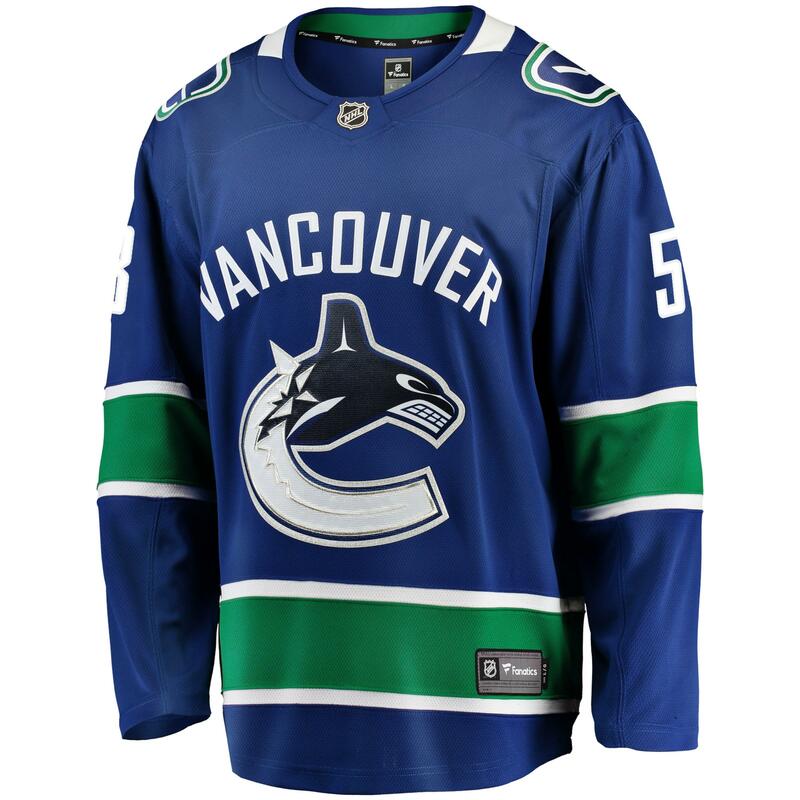 After the Blackhawks, the other big surprise from the Adidas catalog was seeing new primary sweaters listed for the Canucks in 2019-20! It’s unclear whether the Canucks are working on sweeping changes or maybe just updating the crest to remove the superfluous “Vancouver” arched across the top. But I also wouldn’t be that shocked to see a new primary logo to coincide with the 50th anniversary. That means 4 jerseys for next year if you include bringing back the skate. Interesting. My wife go me a Pettersson jersey from NHL shop for Christmas yesterday. I think it's a fanatics jersey or something. It is slightly different from the official team jersey. Curious if it might reflect something of this new one. It's similar to this one. The name and number plates are like a silver'ish White and it has the white ring around the collar. I think it looks really slick. I'd hope they'd go for something more substantial than that for the 50th... but yeah could be. Skate jersey full time please. 50TH ANNIVERSARY: The Canucks may very well be the first NHL team to introduce four new jerseys in the same season — and it’ll be their 50th! So expect to see a 50th logo and patch on all of them during the 2019-20 season. My Christmas just got even better! 50th anniversary season & new home and away uniforms = good riddance bad luck corporate Orca. Probably just small changes or 50th anniversary ones. Honestly, would not mind a complete overhaul of the current uni’s. Something new to represent this new era of Canucks. Whew, only have to wear my Pouliot jersey for the rest of this year. Time to rid ourselves of the McCaw era Orca brand jersey logo! My Megna jersey is hanging in the closet, want it? Back to the originals would be my guess. I'd rather them make minor changes. We need to keep a consistent identity. The leafs Canadiens Oilers flames Blackhawks redwings rangers flyers penguins etc have all generally had the same logo besides minor tweaks. Every one of our logos has been outrageously different. The stick in rink, the flying skate, the flying V, the orca, and Johnny canuck (pre nhl). Stay consistent with the orca, we change more outfits than my girlfriend before a dinner party. Considering that next season is the Canucks' 50th anniversary, a club just doesn't make cosmetic changes to its primary look. There is a lot going on in the Canucks' brand - Orca, modified and classic Stick﻿ ﻿in Rink, Johnny Canuck. Ditching the bad luck and corporate Orca is a no-brainer. The classic Stick in Rink and Johnny Canuck represent the 3 H's - Heritage, History & Hockey. That's what the Canucks need to﻿ market and build on for their 50th and beyond. We can agree to disagree. I wouldn't call the orca bad luck... we have had our most successful hockey with that uniform. And ya, orca bay doesnt own anymore but the orca is still very much a symbol of the north pacific and the west coast. I don't mind the orca. I think the "VANCOUVER" above has to go.... is there any other NHL team that has to spell out were they are located above their logos? I'm thinking new collar design and VANCOUVER word mark being removed. And ya, orca bay doesnt own anymore but the orca is still very much a symbol of the north pacific and the west coast. A logo is supposed to represent the team name, not the region. It was inspired by the Orca Bay ownership. 1. Ohlund's eye injury in practice. This injury hampered his offensive potential. 2. Naslund breaking his leg in Buffalo in 2001 while enjoying a career year. Lost for the remainder of the season and playoffs. 3. Cloutier's 2002 gaffe vs Lidstrom in the playoffs. 4. Luongo's choke jobs and meltdowns in the playoffs. 5. Boeser crashing into the open side of the gateway to the Canucks' bench, therefore ending his season and costing him the club rookie records for goals and points and the Calder Trophy.